5 Surgical Procedure & Types of Partial Knee Replacement. A partial knee replacement (PKR) is a surgical procedure to replace only one part of a damaged knee. It can replace either the inside (medial) part, the outside (lateral) part, or the kneecap (Patellofemoral) part of the knee. With PKR, only the damaged area of the knee joint is replaced, which may help to minimize trauma to healthy bone and tissue, and also helps relieve arthritis in on or two of the three compartments of the knee. Surgery to replace the whole knee joint is called total knee replacement. Partial Knee Replacement is intended for use in individuals with joint disease resulting from Degenerative, Rheumatoid and post-traumatic arthritis, and for moderate deformity of the Knee. People with advanced osteoarthritis and conservative treatments have been exhausted. Mild valgus or varus deformity. Pain is often noted when performing physical activities requiring a wide range of motion in the knee joint. X-ray and MRI of the joint will reveal the joint disease resulting from Degenerative, Rheumatoid or any Post traumatic arthritis, and also moderate deformity of the Knee. The x-ray indication for a knee replacement would be weightbearing x-rays of both knees- AP, Lateral, and 30 degrees of flexion. AP and lateral views may not show joint space narrowing, but the 30 degree flexion view is most sensitive for narrowing. 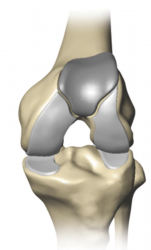 If this view, however, does not show narrowing of the knee, then a knee replacement is not indicated. 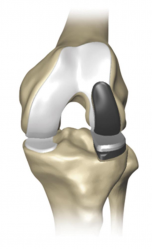 Surgical Procedure & Types of Partial Knee Replacement. Unicondylar Knee Replacement is a procedure that replaces only the single affected compartment of the knee, either the medial or lateral compartment. Patellofemoral Knee Replacement is a procedure that replaces the worn patella (the kneecap) and the trochlea (the groove at the end of the thighbone). Bicompartmental Knee Replacement is a procedure that replaces two compartments of the knee, the medial and patellofemoral compartments. Pre-operative preparation begins immediately following surgical consultation and lasts approximately one month. The patient is to perform range of motion exercises and hip, knee and ankle strengthening (Isometrics) as directed by Therapist. Before the surgery is performed, pre-operative tests are done: usually a complete blood count, electrolytes, APTT and PT to measure blood clotting, chest X-rays, ECG, and blood cross-matching for possible transfusion. Preoperative education is currently an important part of patient care. There is some evidence that it may slightly reduce anxiety before knee replacement surgery, with low risk of detrimental effects. Weight loss surgery before a knee replacement does not appear to change outcomes. To increase the likelihood of a good outcome after surgery, multiple weeks of physical therapy is necessary. In these weeks, the therapist will help the patient return to normal activities, as well as prevent blood clots,improve circulation,increase range of motion,and eventually strengthen the surrounding muscles through specific exercises. Passive range of motion <90 degrees (secondary to stitches) x 2 weeks. Active range of motion 0-90 degrees. Active range of motion 0 to 110 degrees. Passive range of motion 120 degrees. Walk downstairs with reciprocal gait. Treatment includes encouraging patients to move early after the surgery. Often range of motion (to the limits of the prosthesis) is recovered over the first two weeks (the earlier the better). Over time, patients are able to increase the amount of weight bearing on the operated leg, and eventually are able to tolerate full weight bearing with the guidance of the physical therapist. After about ten months, the patient should be able to return to normal daily activities, although the operated leg may be significantly weaker than the non-operated leg. For knee replacement without complications, continuous passive motion (CPM) can improve recovery. Additionally, CPM is inexpensive, convenient, and assists patients in therapeutic compliance. However, CPM should be used in conjunction with traditional physical therapy. In unusual cases where the person has a problem which prevents standard mobilization treatment, then CPM may be useful. Some physicians and patients may consider having lower limbs venous ultrasonography to screen for deep vein thrombosis after knee replacement.However, this kind of screening should be done only when indicated. If a medical condition exists that could cause deep vein thrombosis, a physician can choose to treat patients with cryotherapy and intermittent pneumatic compression as a preventive measure. 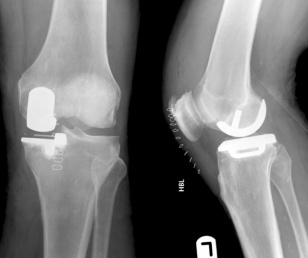 Partial Knee EReplacement surgery is not appropriate for patienst with certain types of Infections, any mental or Nueromuscular disorder which would create an unacceptable risk of prosthesis instability, prosthesis fixation failure or complication in postoperative care, skeletal immaturity, severe instability of the knee or Excessive body weight. Comom side effects:as with any surgery, PKR has its risks which may be Implant related risks which may lead to a revision include dislocation, loosening, fracture, nerve damage, heterotropic ossification, wear of the implant, metal sensitivity, soft tissue imbalance, osteolysis(localized progressive bone loss) and reaction to particle debris. 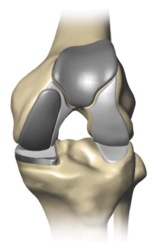 Knee implants may not provide the same feel or performance characteristics experienced with a normal healthy joint. ↑ Van Manen, MD; Nace, J; Mont, MA (November 2012). "Management of primary knee osteoarthritis and indications for total knee arthroplasty for general practitioners.". The Journal of the American Osteopathic Association. 112 (11): 709–715. PMID 23139341. ↑ Deyle GD, Henderson NE, Matekel RL, Ryder MG, Garber MB, Allison SC (February 2000). "Effectiveness of manual physical therapy and exercise in osteoarthritis of the knee. A randomized, controlled trial". Ann. Intern. Med. 132 (3): 173–81. doi:10.7326/0003-4819-132-3-200002010-00002. PMID 10651597. ↑ Chesham, Ross Alexander; Shanmugam, Sivaramkumar (13 October 2016). "Does preoperative physiotherapy improve postoperative, patient-based outcomes in older adults who have undergone total knee arthroplasty? A systematic review". Physiotherapy Theory and Practice: 1–22. doi:10.1080/09593985.2016.1230660. PMID 27736286. ↑ McDonald, S; Page, MJ; Beringer, K; Wasiak, J; Sprowson, A (13 May 2014). "Preoperative education for hip or knee replacement". The Cochrane Database of Systematic Reviews (5): CD003526. doi:10.1002/14651858.CD003526.pub3. PMID 24820247. ↑ Smith, TO; Aboelmagd, T; Hing, CB; MacGregor, A (September 2016). "Does bariatric surgery prior to total hip or knee arthroplasty reduce post-operative complications and improve clinical outcomes for obese patients? Systematic review and meta-analysis.". The bone & joint journal. 98–B (9): 1160–6. doi:10.1302/0301-620x.98b9.38024. PMID 27587514. ↑ Carter, Evelene M; Potts, Henry WW (2014). "Predicting length of stay from an electronic patient record system: a primary total knee replacement example". BMC Medical Informatics and Decision Making. 14 (1): 26. doi:10.1186/1472-6947-14-26. ISSN 1472-6947. ↑ Valtonen, Anu; Pöyhönen, Tapani; Heinonen, Ari; Sipilä, Sarianna (2009-10-01). "Muscle Deficits Persist After Unilateral Knee Replacement and Have Implications for Rehabilitation". Physical Therapy. 89 (10): 1072–1079. doi:10.2522/ptj.20070295. ISSN 0031-9023. PMID 19713269. ↑ American Physical Therapy Association (15 September 2014), "Five Things Physicians and Patients Should Question", Choosing Wisely: an initiative of the ABIM Foundation, American Physical Therapy Association, retrieved 15 September 2014, which citesfckLRfckLR Harvey, LA; Brosseau, L; Herbert, RD (Mar 17, 2010). 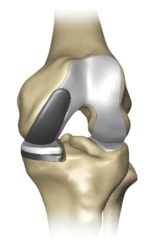 "Continuous passive motion following total knee arthroplasty in people with arthritis.". Cochrane database of systematic reviews (Online) (3): CD004260. doi:10.1002/14651858.CD004260.pub2. PMID 20238330. ↑ Dallan C. Manscill (June 16, 2015). "Intermittent Pneumatic Compression and Treating Deep Vein Thrombosis & Pulmonary Embolism".